Founded in 2011, Immaculate Cleaning offers premier janitorial cleaning services designed for commercial buildings, government facilities, healthcare facilities, places of worship, schools and universities, retail locations and sports and entertainment venues. The company specializes in day porter services, general daily cleaning, floor and upholstery care, post-construction clean-up and event setup and takedown and takes pride in using innovative, green cleaning methods and non-toxic solutions that clean better and faster, without harming the environment. 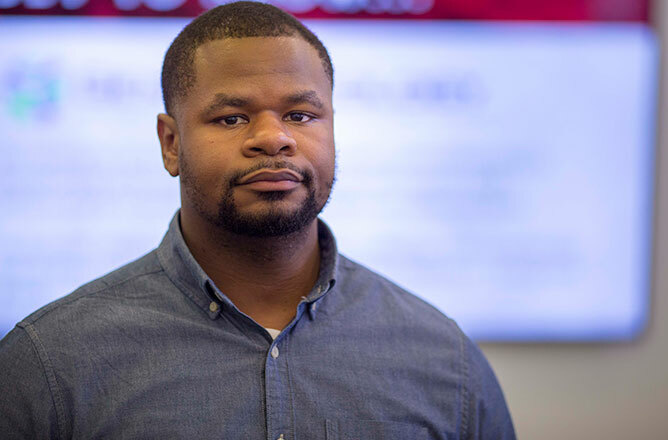 Company founder James Barnes is also a part of JumpStart’s Core City: Cleveland Impact Program, an intensive business assistance program designed to support the development and growth of businesses located within Cleveland’s core neighborhoods. We recently sat down with James to discuss his business and his experiences in the Impact Program. 1. What inspired you to create your business and what separates you from your competition? I’ve always been passionate about business and entrepreneurship and had some ventures already going as a young man, and when I graduated high school, I just elevated those basic principles and created this company. I first heard about Core City through Cleveland Chain Reaction and I thought it would fit our business perfectly, especially because of the focus on giving back to the community by creating jobs. The biggest impact so far has been the constant face-to-face with my advisors and other people at JumpStart who have helped me push my business forward. 3. Has anything surprised you about the program? I know now that JumpStart and the resources they provide have been here for a while, but I never really had the time to learn more and engage before. The Impact Program definitely came at just the right time for me. 4. What advice would you give to other entrepreneurs who might be considering reaching out? Do it. The first step to getting help is reaching out. It’s a great program, whether you need help with how to structure your business, or just need help growing. 5. What are your future plans for your business? We’re getting very aggressive with our sales and marketing plans and next year we hope to reach the seven-figure milestone in sales. After that, we hope to use the same formula and just keep growing going forward. Learn more about Immaculate Cleaning Co. at immaculatecleaningohio.com. Then, come watch James pitch his business live on December 5 for a chance to win up to $10,000 at the Core City Cleveland Entrepreneur Showcase.